My Slow Cooker Creamy Vegan Tomato Soup is easy and so dreamy! It’s creamy from cashews & oats. Leave out the cashews if you don’t do nuts. I want to share one of my favorite lazy recipes with you today. 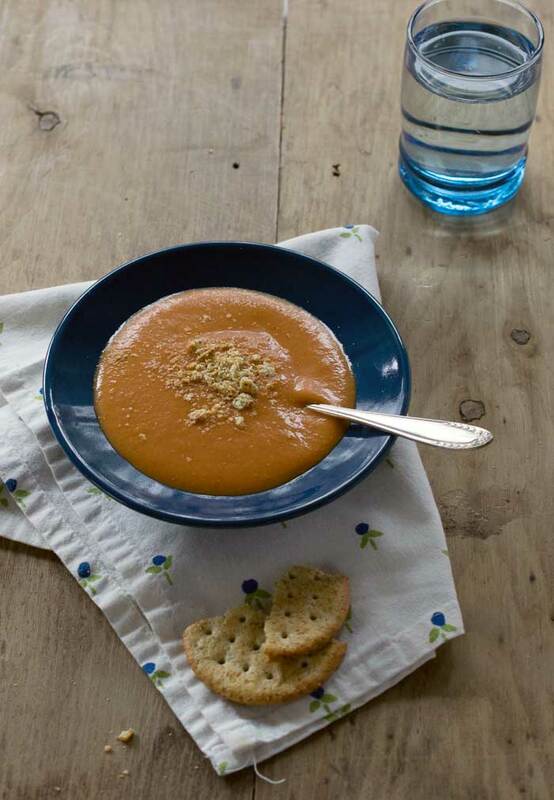 My Quick and Easy Creamy Tomato Soup comes together with the least effort and tastes like you worked hard all day. Can I Cook This in My Slow Cooker? Instant Pot? Stove-top? I have 2 different methods to cook it for you to choose from on this post, on the stove or in your slow cooker. You can even make it in a heated blender if you have one! Get the Instant Pot version of this recipe on my new site here: heated blender. How Can You Make a Dairy-Free Soup Creamy? Basically, you are cooking the oats and softening up the cashews. The oats and cashews are what makes this soup extra creamy. 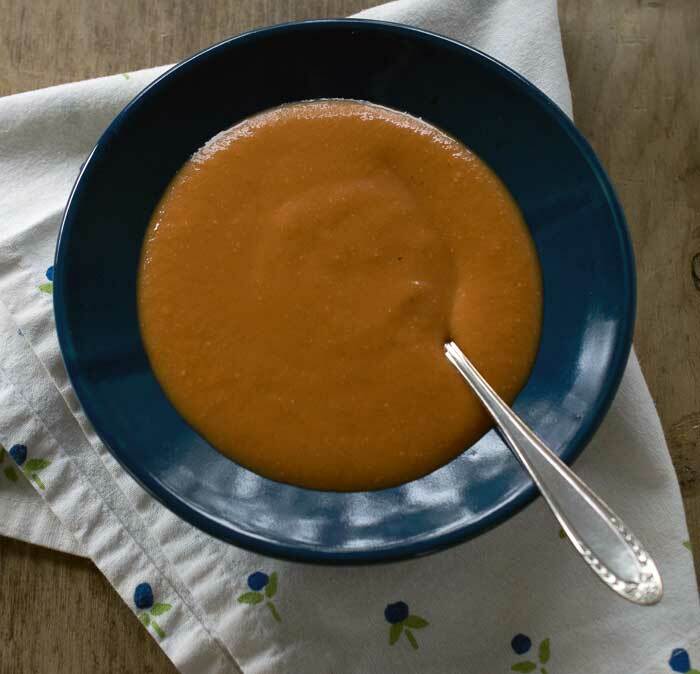 I like my Slow Cooker Creamy Vegan Tomato Soup to be very thick, but you can add extra water to thin it out if you prefer it that way. 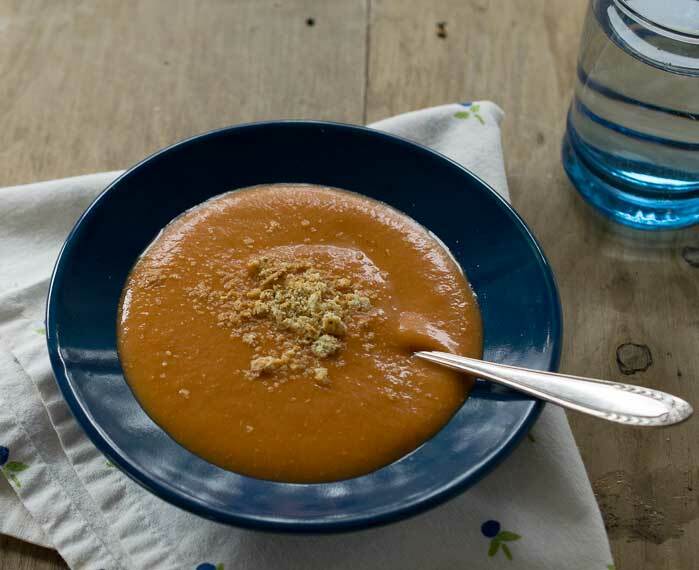 This soup is as easy as the condensed soups but free of the corn syrup and preservatives. You need a few things from your pantry, then you can make it in your slow cooker, Instant Pot or on the stove-top. Please note that you can easily halve this recipe and just use 1 can of either type tomatoes you happen to have on hand. Add all the ingredients EXCEPT for the agave nectar, salt and pepper to your Instant Pot. Cook on manual for 5 minutes and let the pressure come down naturally - that will take about 10 minutes. Add all the ingredients EXCEPT for the agave nectar, salt and pepper to your slow cooker. Cook on low 8 to 10 hours. Add all the ingredients EXCEPT for the agave nectar, salt and pepper to a soup pot. Cook on medium heat for 15 minutes to soften the cashews. Carefully pour the cooked mixture into a blender and blend until smooth. You may need to do this in 2 batches. Add agave nectar if using and salt and pepper to taste. You can also add more water if the soup is thicker than you want it to be. Just put this in my crockpot! I have to cook it on high for a while and then on low. I plan to try blending it at the end with a hand blender. Thank you! What is an instant pot? I’ve never heard of it, is it something new on the market? Small pressure cooker. Can be found on Amazon. Recipe sound wonderful, will make it at a later time. This was very good! I made this in my Instant Pot. I didn’t have whole tomatoes so I used diced along with the crushed. I didn’t add agave, salt or pepper. I tried the immersion blender, but it didn’t get the soup smooth enough for me. My trusty Vitamix did the trick! Praises for this recipe! I modified it: cut it in half to fit in a small Crockpot, omitted cashews which I can’t eat ((instead I doubled the oatmeal for thickening and added nutritional yeast at the end for flavor), omitted agave nectar, and–here it comes–I quintupled the garlic! it came out marvelous, and even my tough critic husband thinks it’s a keeper. Thank you, Kathy! I love hearing how people modify my recipes to fit their needs. I’m so glad you like it! We are making this for the second time this week. We loved it SO much! It is decadent and delicious and better than tomato soup I’ve had in high-end restaurants here in the Washington D.C. metro area. This is going to be in our rotation on a regular basis throughout this winter. This next time we’re planning on serving it with vegan grilled cheese sandwiches. My mouth is already watering thinking about this soup. I may double the recipe because my wife loves taking it to work for lunch the next day. I love your website and love your new book! The Instant Pot has changed our lives, helping us stick to our vegan diet as well as prepare all of our meals at home. Loved this! It was remarkable-I’ll make it often! is there anything you would recommend to replace the oats? I cannot have oats unfortunately. Thank you. You could leave out the oats and add a little more cashews. what can use instead of vegetable cubes? You could use any vegan bouillon you have. I make my own and freeze them in cubes. You can get that recipe here: . However, if you want to make it right now and you don’t have any on hand add a little nutritional yeast. Great soup! This is a keeper!! Hello. Does it matter if its in high pressure or low pressure setting? High pressure is usually what I use unless low is specified. In this recipe, I don’t know that it matters too much. I don’t see agave nector in the ingredient list, but I see it listed in the cooking steps. How much do I use? Just add a little maybe a teaspoon or so, just to make the flavor less acidic. Have you ever made this with fresh tomatoes? I have a whole bunch that I need to use, and am wondering how I might need to adjust the recipe to use those instead. What are you thoughts? I haven’t made this with fresh tomatoes, but you should be able to. It will be much thinner, so you may have to cook it with the lid off until it gets thick enough. I made this on a freezing cold night and it was perfect! So easy and delicious! I’m not an experienced cook and made it in the Instant Pot. It’s foolproof! Definitely a keeper. I just tried to make this soup , the tomato one, and just added everything into the instant pot and put it on for 5 min. I ended having the burn sign come on after maybe 3 – 4 min So I stopped it and shut it off. I will end up cooking it on the stove. Still a beginner with my new instant pot but not having much luck. What size is your IP? I’ve made this in a 6-quart several times with no issues. I’d be happy to help you troubleshoot it though. Could you use vegetable stock in place of water and vegetable cubes? Made this soup in my Instant Pot Ace Blender. I halved the recipe and used a heaping tablespoon of nutritional yeast instead of the veggie bullion. Turned out fantastic! So delicious! Definitely a keeper…so quick and easy. I will be making this again soon! What type of cashews are being used in this recipe – raw or roasted? I use raw, but you could use roasted in a pinch. My slow cooker is only 1.5 qt. but since you suggest adding hot water if the soup was too thick, I only added about 1 cup water (used to rinse out the cans) to cook the soup rather than halving the recipe. Worked great! I’ve been adding a bit of water to each bowl. I prefer a “creamier” tomato soup, so next time I’ll add extra oats. Also, rather than drag out the Vitamix, I used my stick blender. A few tomato pips survived, but good enough for me!